Good fish cookery takes some serious practice, but there are lots of tricks and tips out there that’ll help you in the short term. We grilled Angler executive chef Gary Foulkes – one of the finest fish cooks in the UK – for his expert advice on cooking up a perfect bit of fish. Ask almost any chef and they’ll tell you – fish cooking is one of the toughest things to master. Take it out of the pan a tiny bit too early and the insides will be jelly. Leave it in the pan too long, and the delicate, flaky flesh starts to go mushy, and your skin goes from crispy to just plain burnt. 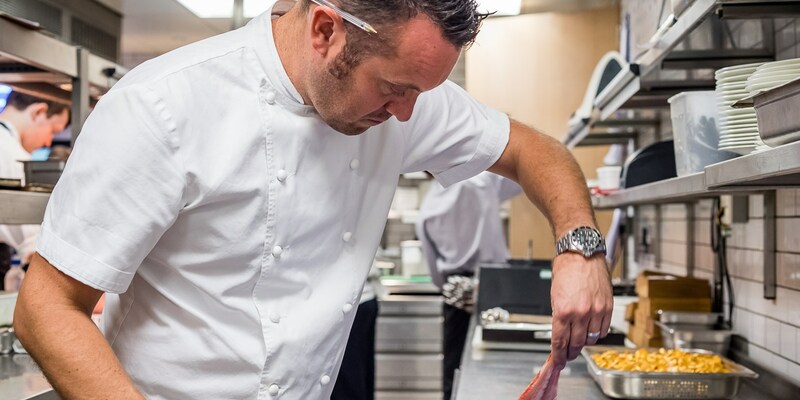 Cooking fish like a professional chef requires a lot of things, but most important among them is experience, says Gary Foulkes – executive chef at Michelin-starred fish and seafood restaurant Angler. ‘Cooking fish is one of those things – the more you do it the better you become at it,’ says Gary, who spent many years as both sous chef and head chef with Phil Howard at The Square before taking over the kitchen at Angler. ‘There are so many different avenues you can go down. A lot of cooking fish is down to touch and timing and experience, but there are some useful things to look out for.’ Thankfully, Gary was on hand to break things down for us, starting with a classic pan-roast. ‘You need a good non-stick pan to pan-roast a fish, that’s the first thing!’ says Gary. ‘Cast iron pans are great for some things, but not so much for fish – because you have to get them so hot for something not to stick in there, they can be a little bit too harsh for cooking fish. ‘Take a nice non-stick pan, add a tiny bit of oil then put your fish in skin-side down. It can be on a nice medium to high heat (you don’t want the harshness of a screaming hot pan) – just cook the fish gently. It only takes a few minutes to cook a nice piece of fish, and then when you flip it over you have a nice crispy skin that isn’t burnt or shrivelled up. Steaming is a healthier, gentler way to cook your fish. There’s no oil or butter required and the fish retains most of its nutrients, but you won’t get that delicious crispy skin as a result. Delicate white fish generally steams nicely – sea bass, bream and tilapia are often steamed in Asian cooking – and salmon works nicely too. ‘I think brill and turbot are both fantastic steamed,’ says Gary. ‘You can do anything with turbot really – it’s the king of fish. When your fish is cooked it’ll be delicately flaky all the way through the fillet and you’ll be able to peel the skin off without breaking any of the fish. ‘If you try and pull the skin off and bits start breaking, it’s not cooked enough and it needs a bit longer,’ says Gary. Barbecues can be a rare treat in the UK, but if the planets align and you find yourself warming up the coals on a sunny afternoon, pick up a bit of monkfish from your local fishmonger. ‘For me, barbecuing is the best way to cook monkfish,’ says Gary. ‘Monkfish tail is brilliant because you can split it into those lovely fillets and cook them whole, which results in a better texture and flavour than smaller pieces. If I cook monkfish, I always cook it whole on the barbecue and then slice pieces off. ‘Another nice thing I like to do with monkfish is to age it in a bit of double cream,’ he continues. ‘It helps tenderise the fish, much like in Indian cooking when they add yogurt to marinades. Age it for a couple of days in cream, then wash it off, pat it dry, coat it in oil and get it straight onto a raging hot barbecue. Get a nice colour all the way around the fish, keep closing the lid to get it nice and smoky and the result is absolutely amazing. ‘Grills don’t get as hot as barbecues and you’re getting heat from the top instead of the bottom, but a lot of the same rules still apply,’ says Gary. Grilling is a really easy and quick way of getting a lovely result out of a fillet of fish and works well for white fish fillets like sea bass and bream, as well as oily fish like mackerel.